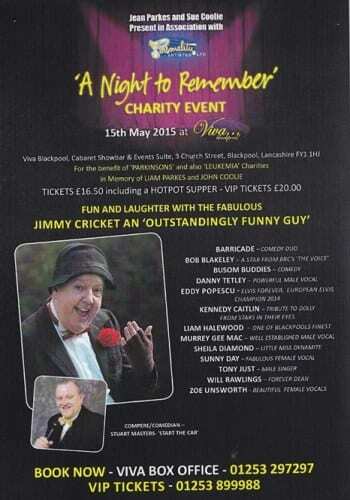 Entertainer Jimmy Cricket will be appearing in a huge charity gala at the Viva cabaret venue in Blackpool on May 15. The line-up for A Night to Remember is a stunning collection of high-quality performers, who have been assembled by the organisers of this fundraising event, Jean Parkes and Sue Coolie. Jean is a former manager of the Bradford Theatres organisation and now runs an agency in Blackpool called Personality Artistes. The proceeds from the event will go towards charities, which are associated with two worthy causes – Parkinson’s disease and leukaemia. Book your tickets now with the Viva box office on 01253 297297.